When in a pinch, I will occasionally visit the local Chipotle for a quick lunch; their carnitas or barbacoa salad with extra salsa, hot sauce, and guacamole is extremely filling, and not too hard on the wallet when it comes to healthy eat-out options. 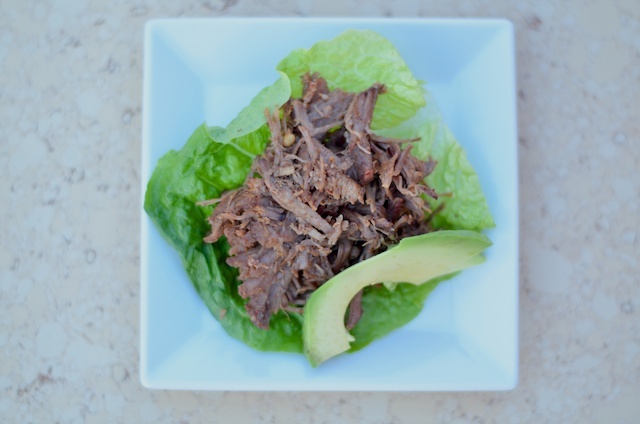 The other day, I wanted to attempt to recreate some of what I love about barbacoa at home. This was a pretty successful recipe, looking back. I realized that the piece of meat we had purchased needed more time to cook than I originally thought, or we might have upped the temperature 25º, but hey, you live and learn. I hope you will give this a shot at home to save the wallet from ordering out, but also have the satisfaction of a delicious home cooked meal. Barbacoa is traditionally cooked over a fire or buried underground wrapped in leaves and cooked in a pit with coals and covered with dirt for 8-10 hours (thanks, Wikipedia!). I’m taking the term loosely and going more with the modern definition, meaning “tender.” This can also be made from pork, and is traditionally known as the aforementioned carnitas. Combine dry ingredients and can of diced green chilies to create a wet rub for the meat. Allow the meat to rest outside of the refrigerator while the oven preheats to 325ºF. Coat the chuck roast with the wet rub on all sides. Wrap roast in aluminum foil, but place strips of bacon on top of roast before sealing in the aluminum. This is partially to add some additional fat (and the added hickory flavor from the bacon), and partially because… bacon. Roast for 2 and a half hours with the bacon side up, and be sure to put a baking pan on the rack underneath the wrapped roast to catch drippings. Flip and cook an additional 2 hours. Remove from oven and allow to sit for 10-15 minutes, and then shred bacon and roast with two forks. If the meat does not easily shred, rewrap the foil and return to the oven in 20 minute intervals. Pour any drippings back into the shredded mixture, and serve. We had it in romaine leaves with avocado slices, but feel free to go nuts with your favorite taco/spicy toppings. My entire family loved this! This recipe is easy to make, very affordable and has a wonderful flavor. Do you think I can make in the dutch oven? I prefer to avoid foil if possible. Thank you for a great recipe! I’m glad you enjoyed it! I’m sure this could be done in a dutch oven or slow cooker; the only thing I caution is that seal may be less tight, so check the moisture levels while cooking to make sure it doesn’t dry out. Thanks for the quick feedback and advice! By the way… I did this recipe in a crock pot and it was delicious and now it can make it into the week night rotation because I can just set it and forget during the day… I cooked mine on high for 5ish hours but I’m thinking you could do this on low for 8. Very Very Good… be aware that it is pretty spicy. Holy Hell…this was freeking awesome!! I followed your recipe to the letter and it turned out perfect. This will be a regular at our house. We Texans LOVE barbacoa!! Thank you so much!! Laura, this comment made my day. So glad you enjoyed it–we haven’t made it in some time, so you may have just encouraged us to put it back into rotation!